German Chancellor Angela Merkel is meeting Thursday with leaders of Balkan nations to discuss Europe's worst migration crisis since World War II. 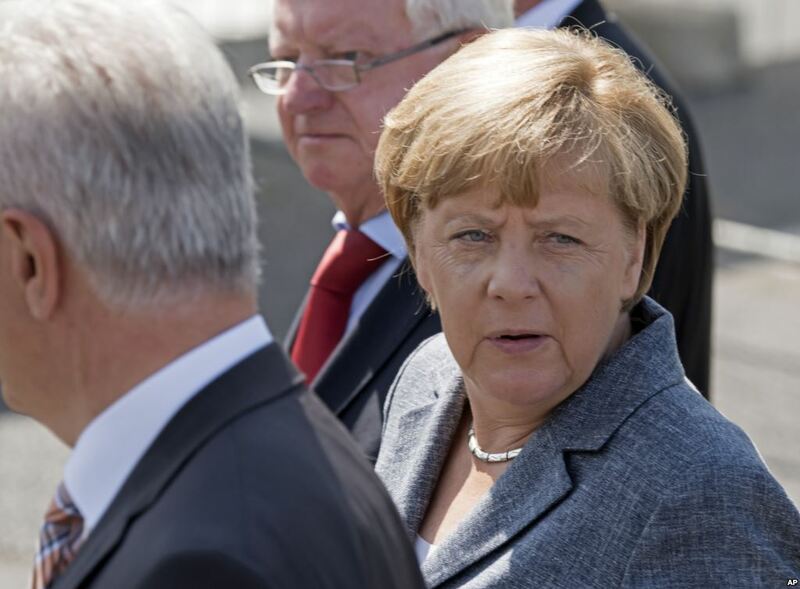 The meeting takes place in Vienna, Austria, Thursday, a day after Merkel faced down jeering anti-immigrant protesters in the eastern German city of Heidenau, saying her country has no tolerance for "shameful and repulsive" treatment of refugees. The Heidenau refugee center Merkel visited was the scene last week of neo-Nazi demonstrations. During Merkel's visit Wednesday, several dozen people gathered outside the center, booing and shouting "Traitor, traitor!" Meanwhile, refugee chaos reigned in southern Hungary, with police firing tear gas at a Roszke migrant center when about 200 migrants refused to be fingerprinted and tried to leave. Hungary's national police chief, Karoly Papp, said that by mid-September, more than 2,100 police would be dispatched to the border, along with helicopters, police dogs and patrols on horseback. Budapest is also considering sending in army troops to keep migrants out. Hungarian workers are building a 3.5-meter-high fence along its 175-kilometer border with Serbia to block the asylum seekers from entering. But in the meantime, the refugees are crossing over, under and around a razor-wire barrier into the hands of overwhelmed police who are attempting to fingerprint and process them. Authorities are trying to control the influx of several thousand Syrians, Afghans and Pakistanis seeking to escape war and poverty in their homelands in search of a better life as they cross the Serbian border into Hungary, a member of the European Union. Once in the EU, the refugees can travel passport-free to other EU member states, with many of the migrants heading to more prosperous countries in the north, including Germany and Sweden. Police in Macedonia initially prevented them from passing through that country, but after clashes last Friday and Saturday the migrants swept past overwhelmed police and reached Serbia. More than 250,000 migrants have crossed the Mediterranean to Europe this year according to the International Organization for Migration. Nearly 2,400 people have died making the journey, often in rickety, overcrowded boats. Italy's coast guard reported that about 50 bodies were found Wednesday in the hull of a migrant boat rescued off the coast of Libya even as 439 were rescued. Germany, Europe's wealthiest country, says that 800,000 refugees could settle there, more than four times last year's figure. The agency said Tuesday that it expects 3,000 more people a day will be crossing from Greece into Macedonia, at least for the next few days. The agency stressed the need for humane treatment, and said that the situation in Europe will not change as long as conditions in Syria and Iraq do not change. The United Nations has said it needs $7.5 billion in contributions this year to help Syrian refugees, but pledges by member states have so far covered only 30 percent of that total. U.N. refugee spokeswoman Melissa Fleming said the refugees and migrants - among them many vulnerable women, children and elderly - are in very poor condition when they arrive in Europe. Meanwhile, Francois Crepeau, the U.N.'s special rapporteur on the human rights of migrants, said Tuesday that Europe is failing in its response and needs a new migration policy that emphasizes mobility. "Let's not pretend that what the EU and its member states are doing is working," Crepeau said in a statement. "Building fences, using tear gas and other forms of violence against migrants and asylum seekers, detention, withholding access to basics such as shelter, food or water and using threatening language or hateful speech will not stop migrants from coming or trying to come to Europe." Crepeau said Europe needs to pursue a resettlement program for refugees like those who have fled Syria and Eritrea, saying that kind of program would not only help countries prepare for people they choose to let in but also discourage smugglers and profiteers who currently moving migrants to Europe by dangerous methods.